Bacillus anthracis (BA), the etiological agent of anthrax, secretes protective antigen (PA), lethal factor (LF), and edema factor (EF) as major virulence mediators. Amongst these, PA-based vaccines are most effective for providing immunity against BA, but their low shelf life limits their usage. Previous studies showed that B-cell epitopes, ID II and ID III present in PA domain IV possess higher toxin neutralization activity and elicit higher antibody titer than ID I. Moreover, N-terminal region of both LF and EF harbors PA-binding sites which share 100% identity with each other. Here, in this study, we have developed an epitope-based chimeric vaccine (ID–LFn) comprising ID II–ID III region of PA and N-terminal region of LF. 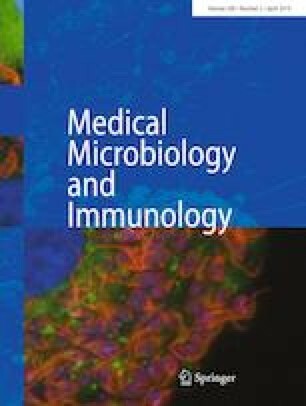 We have also evaluated its protective efficacy as well as stability and found it to be more stable than PA-based vaccine. Binding reactivities of ID–LFn with anti-PA/LF/EF antibodies were determined by ELISA. The stability of chimeric vaccine was assessed using circular dichroism spectroscopy. ID–LFn response was characterized by toxin neutralization, lymphocyte proliferation isotyping and cytokine profiling. The protective efficacy was analyzed by challenging ID–LFn-immunized mice with B. anthracis (pXO1+ and pXO2+). ID–LFn was found to be significantly stable as compared to PA. Anti-ID–LFn antibodies recognized PA, LF as well as EF. The T-cell response and the protective efficacy of ID–LFn were found to be almost similar to PA. ID–LFn exhibits equal protective efficacy in mice and possesses more stability as compared to PA along with the capability of recognizing PA, LF and EF at the same time. Thus, it can be considered as an improved vaccine against anthrax with better shelf life. 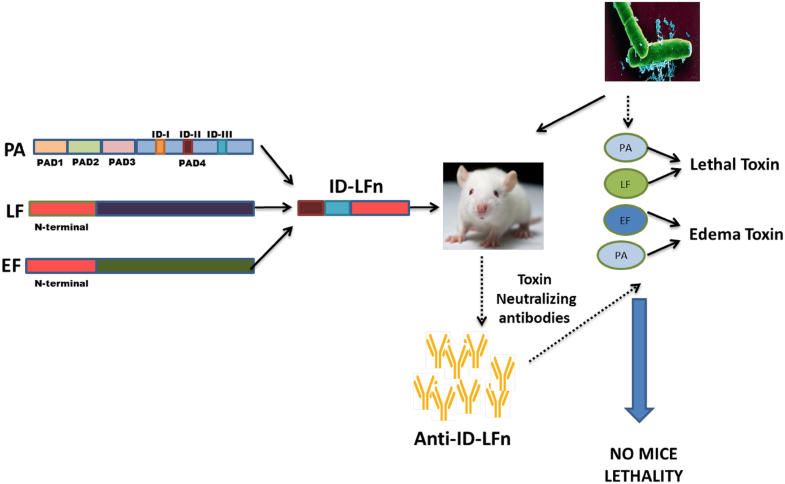 ID-LFn, a novel multiepitope chimeric anthrax vaccine: ID-LFn comprises of immunodominant epitopes of domain 4 of PA and N-terminal homologous stretch of LF and EF. The administration of this protein as a vaccine provides protection against anthrax. Edited by: V. A. J. Kempf. Somya Aggarwal and Vikas Kumar Somani have contributed equally. SA thanks DHR for Young Scientist Fellowship, VS acknowledges DST-SERB National Post-Doctoral Fellowship, SG thanks CSIR for Senior Research Fellowship and RG acknowledges DST for Inspire Faculty Award. RB acknowledges DBT for funds BSLIII facility. The authors thank JNU for infrastructural support.